Visits to hospital may sometimes be long, but they don't have to be boring. PCH has a range of play and recreation facilities to make your stay more enjoyable. Universal play is for all children and is available at the bedside or in Fun on Four (Level 4) the Starlight Express and LiveWire rooms and Radio Lollipop. Children may access resources through the Toy Library, with support from PCH Volunteers and our non-government partners such as Clown Doctors, Captain Starlight and Animal Companions. Once you have turned on your TV, you will be taken to the welcome screen. Select your character and colour options from the side menu and click OK.
Click OK to view the PES tutorial - it will only take a minute. From the home screen, select from the menu bar what you would like to do. If you need help to navigate either the PES or Patient Meal Ordering System (PMOS), go to the information menu item on the home screen to find the quick reference guides. Fun on Four is the hospital's main recreation area located on Level 4. It has fun spaces for patients, families and visitors to enjoy, away from the clinical environment. 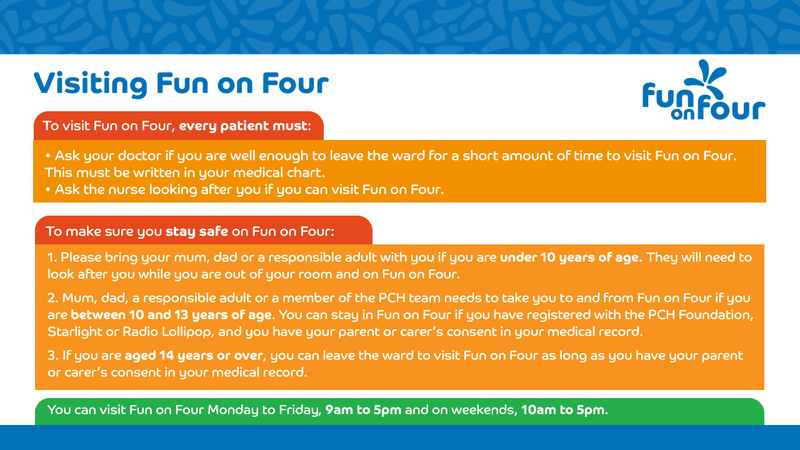 Fun on Four is managed by Perth Children’s Hospital Foundation, as part of its ongoing partnership with the Child and Adolescent Health Service. Staff and volunteers from Perth Children's Hospital Foundation are on-hand and encourage you to get involved in daily activities in the Fun on Four area. Patients and their families can visit Fun on Four between 9.00am and 5.00pm every day. Download our Visiting Fun on Four guide for more on visiting as a patient. The Starlight Express Room and Captain Starlight deliver fun-filled and innovative programs at PCH seven days a week. Located in Fun on Four, visitors can play games, watch movies, create art, see performances and watch and participate in Starlight TV. After 4pm, the Starlight room turns into Livewire, where visitors aged 12 years and older can go to take a break from the wards and participate in fun, age appropriate activities and workshops for older kids. For patients who are unable to leave their rooms, Captain Starlight and Livewire can visit you on the wards. Radio Lollipop broadcasts live every day from their studio on Fun on Four where patients can visit to see for themselves how a radio station operates. You can ring Radio Lollipop on (08) 6456 5629 to request a song, chat, visit, enter some great competitions or even have a go at being a radio DJ. Clown doctors conduct clown rounds four days a week visiting and delivering moments of magic to children and their families in hospital when they need it most. They are skilled entertainers in magic, mime, music and puppetry. Clown doctor visit requests can be made by calling 1300HUMOUR (1300 486 687). The phone line 1300HUMOUR is covered 8.00am to 6.00pm (and sometimes longer) every weekday. Our outdoor recreational space at PCH includes a large outdoor play area on Level 4 and the green space outside the northern entrance on Ground Level. The gardens double as play areas and are planted with native and mature trees, connecting the hospital with nearby Kings Park.